Campbell Creek is a splashy, meandering Class I/II creek that originates in the Chugach Mountains and flows southeast through the urban center of Anchorage, Alaska. Most boaters will float some portion of the 8-mile section between the Piper St cul-de-sac and the Dimond Blvd bridge. Floating Campbell Creek provides a boater with a fish’s-eye view of the lives of thousands of Anchorage residents. The creek passes under highways, through neighborhoods and public parks, past restaurants and behind car dealerships. It snakes around aging apartment towers and ends at the mansion-studded edge of Campbell Lake. On some of its wilder meanders the creek swings away from the roads and trails entirely and you could almost imagine yourself in the wilderness, if not for a stray telephone pole poking up among the trees and the faint roar of traffic. The Campbell Creek watershed can be both surprisingly wild and unmistakably urban. That glimmer underwater is equally likely to be a king salmon or a shopping cart. Floating under the Seward Highway. As long as the water level is moderately good, Campbell Creek is a fun float. It is riffley and rocky, and maneuvering around half-fallen trees and shallows will keep you on your toes. Because boaters occasionally remove log jams, it may be the only creek of its type in the state that can be boated without repeatedly climbing out to avoid obstacles. But Campbell’s real charm comes not from its technical aspects but from the way it gives boaters a new perspective on Anchorage: the good, the bad, the ugly, and the occasionally, kinda, almost sublime. Campbell Creek winds through the center of Anchorage. Campbell Creek is ice-free roughly from early May to the first freeze-up in November or December. If in doubt, bike up or down the Campbell Creek bike path and scout the float to make sure the river is safe to run. Though cooler shoulder-season days can be quiet and peaceful, most people will enjoy floating Campbell on a hot, sunny summer afternoon, probably between June and August. Packrafters on a humid, 79-degree July afternoon. Though the creek can be floated throughout the summer, hot days are often the most fun and relaxing. Water levels on Campbell fluctuate both with the seasons and with rainfall. 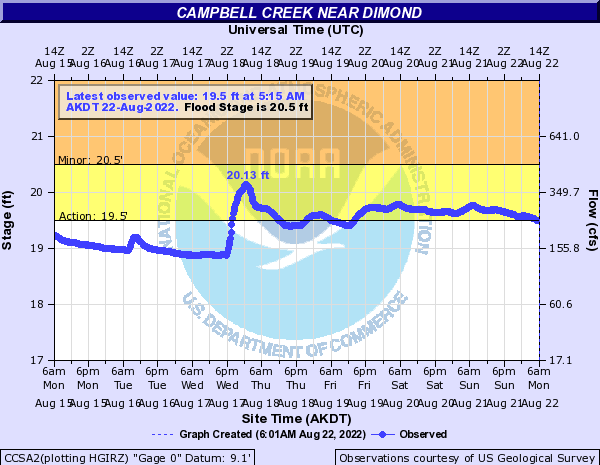 The National Weather Service operates a gauge near the creek’s intersection with Dimond and publishes the data online. Generally, stage heights between 18 and 19 feet at this gauge suggest prime floating conditions. Embed of the Weather.gov hydrograph for Campbell Creek. This embed should automatically update, but if it looks outdated please visit the source page. For the vast majority of the summer the creek runs at safe, low levels. Generally, the lowest water levels occur in mid to late summer during long periods with little to no rainfall. When the creek is very low, it can be difficult to run at all. Snowmelt raises water levels in the spring through early summer, sometimes to flood levels. But the highest water levels occur during fall rainstorms. These rainstorms can drop a large volume of water in a short period of time, and urban landscapes like Anchorage’s are designed to shed water into drainages as quickly as possible. Severe flooding will cause the creek to flow erratically and rip up trees and downed wood, creating entrapment hazards. Never float a creek or river in flood. Paddling the entire 8-mile stretch between Piper St. and Dimond generally takes about four to five hours at a moderate pace with a few breaks. If you have to stop to repair your boat or the river is too shallow to run well, it will take longer. Floating from late morning into the afternoon will often help you maximize direct sunlight. Most small non-motorized recreational boats will be suitable for Campbell Creek. Expect to regularly bottom out on sandbars, thump the bottom of your boat against submerged rocks, and scrape against trees on the riverbanks. Durable boats like river kayaks and packrafts are probably ideal for successfully running the creek from top to bottom. Canoes will generally work well too, though they may occasionally be too long to navigate around tight bends or obstacles. Sit-on-top kayaks and stand-up paddleboards may work depending on the skill of the boater. Make sure your paddles can handle rocky shallows. Floating Campbell Creek in a Kokopelli Renegade packraft. Packrafts are a good choice for Campbell Creek because they are easy to transport and durable enough to handle Campbell’s shallows. Every summer, hundreds of eager captains set off down Campbell in plastic innertubes and vinyl rafts from WalMart and the like. Generally, they won’t make it too far before these vessels are shredded by rocks or branches. By the end of every summer dozens of deflated rafts and tubes can be found caught in log jams and washed up on beaches along the creek. It is possible to run Campbell in a craft like this, but be prepared to make many field repairs. At normal water levels Campbell Creek is generally shallow enough that an adult could stand up and walk out of it. Still, there are deep holes and stretches, especially during the last couple miles. Wearing a life jacket would be wise, if only because it will keep you warmer and set a good example for kids who see you on the creek. Typically, the only potential technical hazard on the creek comes from downed trees–sweepers, strainers and log jams. Boaters do occasionally clear downed trees, but conditions on the creek change too frequently to rely on this for your own safety. During some summers it’s possible to float the entire creek without getting out, while on others you may have to portage several times. Be careful going around blind corners and watch out for log jams and strainers, which can trap boats and people. Even a small creek like Campbell can be surprisingly powerful. The water quality in Campbell Creek isn’t very good, though it’s rarely considered a health hazard by the Municipality. The worst water quality often occurs during flood conditions, when you wouldn’t want to be on the creek anyway. Don’t drink the water, and after your float give your gear (and yourself) a good cleaning. On a sunny summer weekend you’ll pass a cross-section of the city’s residents: children splashing in the water at Campbell Park, fishermen angling for salmon near Taku Lake, armadas of boozy fellow floaters on inner tubes, guitarists serenading girlfriends on one of the dozens of “secret beaches” along the way. People will often smile and wave at boaters, or stop on the bridges to take photos. On a drizzly November afternoon you might have the creek to yourself and the wildlife. Campbell Creek’s animal residents include beavers, muskrats and many types of migratory birds. Moose are a common sight (including, occasionally, right in the creek), and should be given plenty of space in the spring when they have calves and in the fall during the rut. As the bear-proof trash cans up and down the greenbelt suggest, bears do move up and down the greenbelt but are very rarely seen. The 8-mile section of Campbell Creek between Piper Street and Dimond flows almost entirely through public land designated as the Campbell Creek Greenbelt, and passes numerous public parks, parking lots, and other access points. The paved Campbell Creek bike path winds through the greenbelt, crossing and recrossing the creek many times. If you need to take out unexpectedly for any reason, you can easily make your way to the bike path and simply walk to the nearest public access. Between Lake Otis and the New Seward Highway there are two brief stretches during which there are homes and yards on both sides of the creek. Be respectful of private property and only cross it in an emergency. Boating map of Campbell Creek, with the creek, bike path, and public access points highlighted. For the vast majority of boaters, the highest reasonable access point for floating Campbell Creek is at the end of the Piper Street cul-de-sac, off of East Tudor Road. There is a small public parking area here on the street, adjacent to the Campbell Creek bike path and a small overlook for watching salmon. This point marks the confluence of North Fork and South Fork Campbell Creek where they flow out of the Campbell Tract. Blowing up packrafts at the small park off the Piper Street cul-de-sac. While it is possible to float the forks above Piper Street, most boaters will find the experience challenging and unpleasant. The forks are shallow, riddled with sweepers and strainers, and in places almost too tight to maneuver a boat at all. Packrafting the south fork of upper Campbell Creek. Attempting to float the north or south forks east of Piper Street is an adventure, but be prepared for low water, constant sweepers, and tight squeezes through grassy passageways. Photo: Matt Bergt. There is a more well-established parking area just downstream of the Piper cul-de-sac at the intersection of Folker and East 46th, and a large parking area somewhat farther down at Campbell Park, at the intersection of Lake Otis and East 48th. The farthest takeout for most boaters is the public park off of Dimond, between Victor Road and Arlene Street. There is a large parking area here close to the creek, and it is easy to take out just before (or under) the Dimond bridge. Beyond the Dimond bridge the creek becomes flat and deep, and soon turns into Campbell Lake. Ownership and public use of Campbell Lake is a point of confusion and dispute. If you do enter the lake, stay close to shore in order to avoid float plane traffic. There is a legal public access easement between 100th Ave and Campbell Lake, but it crosses two private lots and is undeveloped. Exiting the lake at the far end requires that you cross undeveloped private property. Taking out under the Dimond Bridge. A Cultural and Historical Geography of Campbell Creek, by By Cherie Northon, Ph.D. A thorough and interesting history of Campbell Creek and its role in Anchorage (and Alaska) history. National Weather Service (NWS) river gauge at Dimond. Don’t be discouraged to try Elmore Road put-in, this upper stretch is the most remote and wildest on the creek. You can get down to the creek through one of several moose gates. Bring a saw and clear out a sweeper or two, make it easier for your next trip or the next group of boaters.